Our Ultra Military - Industrial Grade Three Layer Epoxy Floor System Provides The Highest Level Of Floor Durability In A Beautiful High Gloss Epoxy Finish. 10 Times Thicker And More Durable Than Retail Epoxies! Go with a proven winning system, over 30 million square feet sold! Packaged In A Complete Easy To Apply Kit With No Prior Experience Needed! A High Gloss Finish So Beautiful It's Often Used By Interior Decorators. Available in a no odor package for jobs in an occupied area. Water Proof, Stain Proof, Highest Impact Resistance, Scratch Resistant, Hot Tire Proof, Impervious To All Vehicle Fluids, Corrosive Road Salts, And Most Industrial Acids. Will Not Yellow, Dull Or Peel! 100% Military Grade Epoxy Resins! Cannot Be Equaled By Any Amount Of Epoxy Sold At Home Improvement Centers, Water Based Epoxies Or Any Epoxy Without An Actual Topcoat. For An Equivalent Coating You Would Have To Pay A Contractor $4.00-6.00 A Square Foot Or More! Your order will include everything needed for a complete professional installation! Two part epoxy primer base coat, our patented three component extra thick 100% military grade epoxy second coat, high gloss urethane fortified ultra high wear clear epoxy topcoat, etching solution, TSP neutralizing powder, anti wear nonslip additive, calibrated notched squeegee(automatically spreads the epoxy at the proper thickness), epoxy rollers(for areas larger than 1500 sq ft, spiked soles, 18" heavy duty roller frame, 18" epoxy rollers, included), mixing bucket, easy to follow instructions and Free Shipping. The Ultra Epoxy Flooring kit is self leveling making it suitable for application by non-professionals. Even first timers can easily apply our kit for a showroom finish floor! Fills in hairline cracks, small chips and pitted areas permanently! For very rough and or badly pitted floors you must do an extra layer of the high build epoxy resulting in four coats instead of three. Please call us to discuss the proper application technique and how much material to order. Don't be fooled by low advertised prices. See our detailed Epoxy Comparison Chart for a true price & specification comparison against other brands! See what the real cost of other brands are and how they compare in the critical test areas of thickness, abrasion resistance, adhesion, impact resistance(hardness) and gloss. One of the most important performance factors of any epoxy is it's Abrasion Resistance Rating. Our Topcoat has an industry best 4mg Loss rating and is why our Ultra Military Grade System is the best epoxy coating in the business bar none! See The Need To Know Tab at top of page to learn more about Abrasion Ratings. Ultra Epoxy Flooring is super versatile and is engineered to be a permanent coating on any type of concrete or wood floors(please specify when using on wood floors) even under the harshest traffic and environmental conditions. Vertical surfaces can be coated with Ultra Wall version without drips or runs. Extra Heavy Duty Epoxy Floor Coating System for Industrial or Military Use, USDA Approved! Conventional floor enamels are 2-3 Mils thick, water based epoxies 3-4 Mils thick, hybrid cycloaliphatic epoxies are under 10 Mils thick. These thin coatings although well marketed with low selling prices are all prone to wearing out prematurely, yellowing and or outright failures. They're no match for our 23 mil thick Ultra epoxy flooring system. See our proprietary Bonding Primer if you need to coat over an existing coating that has worn out. Super thick Ultra Epoxy Flooring is applied with our calibrated notched squeegee and then rolled with our high quality epoxy rollers guaranteeing you a perfectly smooth coating at the proper thickness automatically. No worrying about thin spots or marks that cause uneven finishes and early failure points. Ultra Epoxy Flooring Is Fast Drying (6-8 Hrs. )With No Odor And Cures To A Rock Hard Non-Stick Finish! Makes keeping your floor spotless a snap, simply wipe your floor clean with water and any mild cleaner such as Simple Green. See our full line of Concrete Repair Products for any needed repairs to your floor. Minimum size order for this product is 500 sf. For quantity discounts for over 5000 sf, additional help or service. Call Or Email Us At: Toll Free 866-532-3979 or info@armorgarage.com. Armor Ultra Epoxy Flooring is sold as a complete packaged system for your convenience. Simply enter the square footage of your floor and we will calculate and package everything you need. Minimum order size for this product is 500 sq ft and in 100 sq ft increments after that, ie: 500, 600, 700. Please average up to the next 100 foot increment as a margin of safety due to different concrete porosity, ie: if your floor is 545 sq ft, enter 600 into Qty Box. We recommend that you have a minimum 10% safety factor since every floor has a different porosity and texture and will absorb the product differently. Also note that lighter colors will yield less coverage also. For jobs larger than 5000 sq ft call or email for quantity price discount. When using either the oil primer or the metal & wood primer select the "No Primer" option in the selection box above. It is not necessary to use the standard primer with one of these primers. It will also ensure you'll get the best possible adhesion between the floor and our epoxy. Ultra Epoxy Floor can be applied onto just about any type floor or wall surface and over existing paint. Ultra Epoxy Floor can be used in conjunction with cove base between the floor and wall. This results in a 100% waterproof and sanitary installation as required in commercial kitchens or other food prep areas. Cove Base is recommended when waterproofing a floor that is above a finished space. A cove base forms a seamless and edgeless transition from the floor and up your wall. When coated with our epoxy it forms a waterproof tub. See:Epoxy Crack and Joint Compound, you can form cove base with this and a cove base trowel. Or you can purchase prefab Cove Base such as Easy Cove from easycove.com. Application is good down to 55 degree slab temperature. Apply epoxy floor in a temperature range of 55-95 degrees. Clean floor thoroughly. Oil stains must be removed or primed with our proprietary Oil Primer prior to application. Then etch with the supplied Acid Safe Etching solution. Etching is simply done by mixing the etch solution with water, pour it evenly over the floor and brush it in with a stiff bristle shop broom. Let sit for 5-10 minutes and then rinse. Then sprinkle provided TSP powder evenly over floor, brush in and then rinse thoroughly. Let floor dry 24-48 Hrs at a minimum to be sure concrete has completely dried. Mix each can of the Primer individually then mix primer in a 1:1 part A and part B ratio. Then roller on in an even coat and let dry to the touch. Next mix each can of the epoxy individually then combine the two epoxy parts in a 2 parts of A & 1 part of B Ratio (not the typical 1:1 ratio!) Mix the combined A & B parts for 3-4 minutes using the supplied power drill mounted paint mixer at low speed, making sure to move the mixing wand up & down and scrape the sides to ensure a thorough mix. Armor Ultra Epoxy Flooring once mixed has a Pot life of approximately 45 minutes at 70 degrees before it starts to thicken. DON'T mix all the paint at once, this is NOT like store bought epoxy that has several hours of pot life, just maintain the 2:1 ratio for each batch and make sure to not mix more than you can apply in about 30 minutes. Recommended application method is simply pouring a "bead" from left to right of the mixed material onto the floor and squeegeeing out with the supplied calibrated notched rubber squeegee, do not use a roller pan. The notched squeegee automatically spreads the epoxy at the proper thickness. Once you have the paint evenly squeegeed out roller over it with our 3/8" nap roller to smooth the squeegee ridges and do some additional spreading. Then mix the next batch, this will reactivate whatever epoxy is on the roller, squeegee and mixer so you don't have to worry about the epoxy hardening in between batches and apply to next section. Continue until floor is done, all the sections of epoxy will blend into a seamless finish. Let dry for 8-10 hrs or overnight but not more than 24 hours. Epoxy should be rock hard and then a second coat can be applied if additional thickness is needed. Be sure to NOT leave rollers or squeegees on floor or leaning on walls or columns as they will be welded the next morning to whatever surface you left them in contact with. Dispose of ALL Rollers & Squeegees right away when done. It's a good idea to have a small can of Xylene(available at Ace, Home Depot or Lowes) for clean ups. Next apply topcoat within 24 Hrs after epoxy floor application. You can mix the non skid additive into the Topcoat for a non skid surface and even more durability! Mix at low to medium speed as to not introduce air bubbles into coating. Mix topcoat as often as possible to keep nonslip suspended in coating. Use roller pan and roll on the Topcoat like regular paint and let dry 5-6 Hrs for foot traffic, 24 hrs for light duty traffic such as carts and dollies, 48 hrs for light vehicle traffic and 3 days for heavy traffic such as Forklifts. If you order White, your topcoat will be a two part White topcoat. This is to ensure an operating room bright white finish and to prevent yellowing. You now have the finest and most durable epoxy floor coating possible! Average times to apply is 1000 sq ft/hr for two men per coat. The Ultra System can be easily applied by one person up to floors of 5000 SF. For fastest results for floors over 5000 sq ft we recommend 1 person mixing and 2 men rolling. 10,000 sq ft and up should have 2 men mixing and 3-4 men rolling. This will allow you to get each coat done in about 5-6 hours. 1. 100% Military Grade Polymers and resins. Not water based or a cyclioaliphatic epoxy. 2. Three coat system, comprising of high performance epoxy primer, extra thick high build 100% solids aliphatic epoxy and Ultra High Wear Clear Topcoat with 4mg abrasion loss rating-Best in industry, most so called commercial and industrial epoxies have ratings of 24 up to 55! This means with only a 4mg abrasion loss rating you get the hardest most wear resistant floor possible by far. It's not even close, there is no comparison to any other Do It Yourself epoxy coating. It is also very impact resistant, so dropped tools and parts are no problem! 3. Finished floor thickness - 23 Mils. Standard epoxies are 2-9 Mils thick only. 4. Sold by the square foot in a complete turnkey package, includes all application tools needed and nonslip additive. 500 SF is the minimum order for this product. 5. You can add color chips to the epoxy layer and then seal them in with the provided clear topcoat. See the color chip option at bottom of page. 6. USDA approved, high chemical resistance, high gloss finish and forklift rated. Can handle highly repetitive traffic. 7. Available in a no odor version for floors that are in or next to occupied areas where strong smells may be disruptive. 8. Very versatile and easy to apply can be used on any floor from a residence to factory production areas. Available in a fast dry version for floors that have a short amount of downtime or for outdoor floor areas. 9. UV rated so it won't yellow, very flexible so it won't crack with floor expansion or contraction. 10. See our Crack Repair page for filling in cracks, joints and holes in your floor. Please do not use cheap concrete fillers when using the Ultra System. How quick can I get one of your epoxy flooring kits? Standard colors ship out the next day by Fedex or UPS ground. Cut off time is 1 PM Eastern time. Orders placed after this time are processed the next day and shipped the day after that. Why is Clear additional cost. To do a clear floor properly requires a highly UV resistant coating since clear is the most susceptible to yellowing. Our Clear epoxy is specially formulated not to yellow. Why is Red and White more cost? Red and White are what we call high pigment colors, they require much more pigment to get that bright White and bright Red look. Also you get a lot less coverage so you need more product. With White and Red you will get two base coats and then either a Red or White colored Topcoat. Is Ultra Epoxy Flooring over kill for a residential garage. Many of our customers use Ultra in their garages when they want the absolute highest protection. Is it necessary, no. You can always over protect with no down side but you should never under protect. Meaning you can use our Military or our Commercial epoxy coatings in a residential garage but you can't do the opposite. 60 degrees or warmer is the ideal floor temperature. The warmer the floor the faster the coatings will dry. Do not apply is temperatures will drop below that within 8 hrs of application. New floors still have to be etched clean and concrete must be at least 28 days old. Surface cracks and small divots can be filled in with the epoxy. You may want to mix a small amount of the epoxy and do these areas first with a small brush. Larger cracks and divots or small cracks that run the depth of the slab should be filled in with one of our crack fillers. Self leveling means the coatings will self level themselves, not the floor. If you need to resurface or level your floor you need to use a self level floor slurry. We recommend you use a good quality slurry similar to Ardex-15 and not those available from your Home Improvement store which are subject to chipping and cracking. Check with manufacturer for wait times before applying an epoxy coating. We recommend that you don't fill in your saw cuts or expansion joints. They are there for a reason. The last thing you want is a crack down the middle of your brand new shinny epoxy floor. If there's a crack at the bottom of the saw cut you can fill it with one of our crack fillers then just feather the three epoxy coating in and out of the cuts. This will give the floor a nice dimensional look. If you absolutely cannot live with the saw cuts or expansion joints then you can fill them in with our crack & joint compound. If you have a true expansion joint, one with a black material in it then use our Flexible Joint Compound. Ultra Epoxy Flooring can be applied to curbs and steps for walls we recommend Ultra Vertical version since it is designed not to drip or run down a large vertical surface. Ultra Epoxy Flooring is not recommend for outdoor exposure. See our Ultra Fast version for outdoor rated epoxy. Two versions of nonslip are available, the standard nonslip provides a light traction surface while our heavy duty nonslip provides a more coarse finished surface. This will make it harder to clean with string mops but still easy to clean with stiff shop broom and hose. Power washing can also be done. For scratch repair simply sand the area lightly with 100 grit paper and brush on some topcoat. The scratch will disappear and the new topcoat will blend into the old. Use Xylene for clean ups. Ultra Epoxy Flooring is incredibly strong so you need to clean up all spills or splatters while it's wet. DO NOT forget to throw out all squeegees and rollers when done with each coat. If you leave them leaning on a wall or column like some of our guys have done you will have to jack hammer them off the next morning. A small trap is also a good idea as a small mixing station. Yes you can ad chips into the epoxy floor layer. 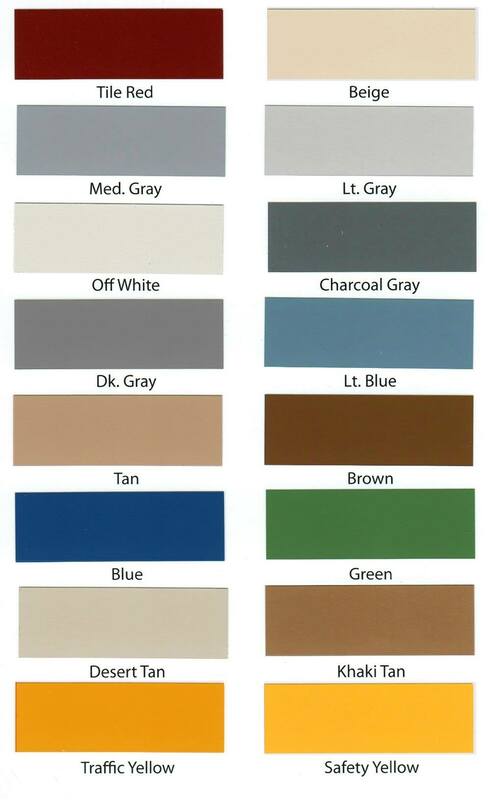 We have any color chip you could want and you can do any amount or color combination you can think of. As a rule of thumb we recommend 6-8 lbs of chips per 500 sf. This will give you nice heavy coverage. We do not recommend full broadcast of chips if you're not a professional, it's difficult to get that many chips on evenly and it will require 2-3 times as much topcoat to fill in all the nooks and crannies. When we do the ASTM abrasion testing we put a weighted abrasion wheel on the epoxy and run it for a certain amount of RPMs and then weigh how much epoxy comes off. This simulates actual wear from vehicle tires, forklifts, pallet jacks etc. Our coating loses an incredibly low 4mgs while our closest competitor loses 24mgs. Our clear topcoat is many orders of magnitude stronger than our nearest competitor at resisting scratches, scuffs and everyday wear and tear from everything from passenger tires to steel wheels. It's because of the patented super hard high performance polymers we use. If you haven't done so yet, watch the video on our home page. It's a close up video of a car's tires twisting and turning into a tight parking spot. It gives you a great visual and audio example of how much stress is put on your epoxy by a car's tires. It also show's you how tough our military grade topcoat is that after 8 years it still looks like the day it was done. This is a tried and true industrial epoxy floor coating. Applying a single coat system or some water based type epoxy for your large industrial or heavy traffic commercial floor would be making a big mistake. There's a reason why we make this a three coat system, it's designed to provide the greatest adhesion to your floor, to be highly impact resistant and extremely durable against abrasion wear. The thing to keep in mind is that epoxy floors fail by either one or all of the following reasons, (1)delamination, (2) chipping/cracking (3) abrasion wear through. Our primer is a two part high performance epoxy based coating that is designed to penetrate into the pores of your concrete floor and provide an inseparable permanent bond to your floor. If you stopped with just our primer you would have a stronger more durable floor than 90% of the epoxy floor paints on the market today. The epoxy base coat is the core, it's an extra thick coating of our extra thick high build military grade 100% solids epoxy for strength, this provides the mass that protects against Hot Tire Lifting, chipping/cracking from impacts and stress from high loads. Then we topcoat it with our Ultra Hard High Wear clear urethane topcoat that keeps your floor looking new longer than any other epoxy product. If and when you manage to wear it out at some point you simply roller on another single coat of the topcoat and the floor comes right back to new again without you ever having to touch the primer or the epoxy! You must have a thickness of 14 Mils or higher and an abrasion loss rating of 12mg or lower for high traffic-high wear floors otherwise you are simply wasting your time and money. Using an under rated epoxy coating for your floor will result in a floor with a very poor appearance a lot quicker than you would ever imagine. Then you will have to do an expensive diamond grinding job to remove the coating and start over with an appropriate epoxy. Some of our competition just use a clear version of their epoxy to save money and be able to say they offer a topcoat. Epoxies are not topcoats, they're nowhere as hard as topcoats, that's why topcoats are more expensive to manufacture than epoxy. Another reason you need a true topcoat is for UV protection. Some manufacturers say they can add in a UV additive, again simply mixing in an additive does not make an epoxy a topcoat! Typical epoxies have abrasion loss ratings from 24mg all the way up to 50mgs. That's exponentially softer than our 4mg loss rating for our topcoat. Most manufacturers don't publish their topcoat specifications they're so poor. If need be you can do your floor in sections. Put a tape line down, use a good tape like Gorilla tape, then apply base coat up to tape line. Then apply Epoxy up to about 6" from tape line. Then apply Topcoat up to about 6" from Epoxy Line. Remove tape and then feather each layer over the it's respective coating. It will all blend in without a seam.